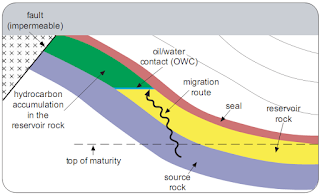 Petroleum System: is the combination of source rock, reservoir rock, migration time and seal rock. Energy choices, Energy problems: Energy usage in industrialized countries grew with dizzying speed through the mid-20th century, and during this time people came to rely increasingly on oil. Eventually, oil supplies within the borders of industrialized countries could no longer match the demand, and these countries began to import more oil than they produced themselves. 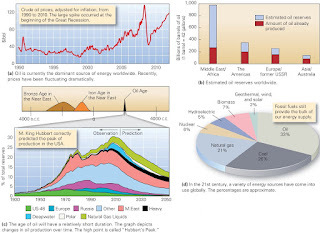 Oil and gas: For reasons of economics and convenience, industrialized societies today rely primarily on oil (petroleum) and natural gas for their energy needs. Oil and natural gas, both fossil fuels, consist of hydrocarbons, chain-like or ring-like molecules made of carbon and hydrogen atoms. Chemists consider hydrocarbons to be a type of organic chemical. Coal: Energy from the Swamps of the Past: Coal, a black, brittle, sedimentary rock that burns, consists of elemental carbon mixed with minor amounts of organic chemicals, quartz, and clay. 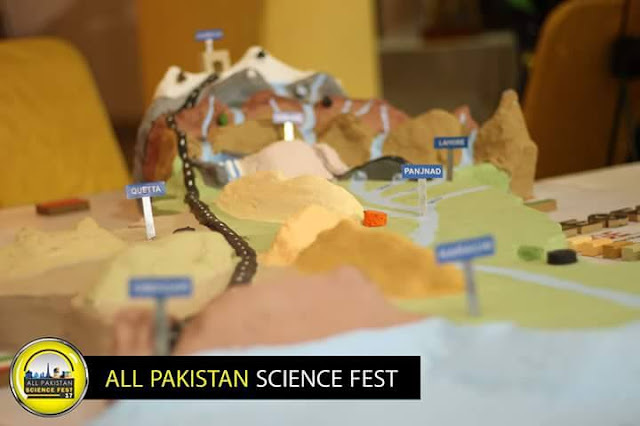 Typically, the carbon atoms in coal have bonded to form complicated molecules. 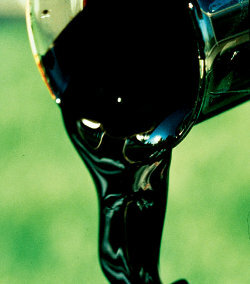 Note that coal and oil do not have the same composition or origin. In contrast to oil, coal forms from plant material (wood, stems, leaves) that once grew in coal swamps, regions that resembled the wetlands and rain forests of modern tropical to semitropical coastal areas. Unconventioal reseves of Hydrocarbons: Oil that can be extracted from reserves in the porous and permeable reservoir rocks of oil traps. Such reserves have come to be known as conventional reserves, because accessing them uses technology that has been around for years. In the past 10 to 15 years, energy companies have begun to increase their focus on extracting hydrocarbons from unconventional reserves, meaning reserves that had previously been left in the ground or disposed of because they cannot be tapped without using new technologies. Let’s look at a few examples of these reserves. Oil exploration and production: In the United States, during the ﬁrst half of the 19th century, people collected “rock oil” (later called petroleum, from the Latin words petra, meaning rock, and oleum, meaning oil) at seeps and used it to grease wagon axles and to make patent medicines. But such oil was rare and expensive. Is There Oil Beneath My Property? : Accumulations of crude oil and gas require a source rock, which is an organic-rich sedimentary rock that produces petroleum as the organisms decompose following burial. Petroleum migrates from the source rock until it encounters impermeable rock or the earth's surface, where it is lost in seeps. 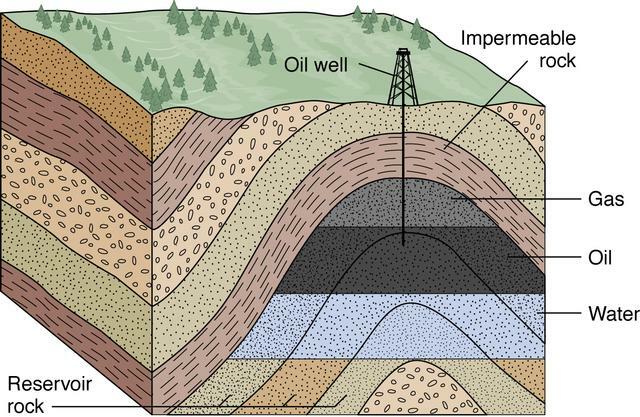 Porous and permeable reservoir rocks allow petroleum to accumulate below impermeable layers. 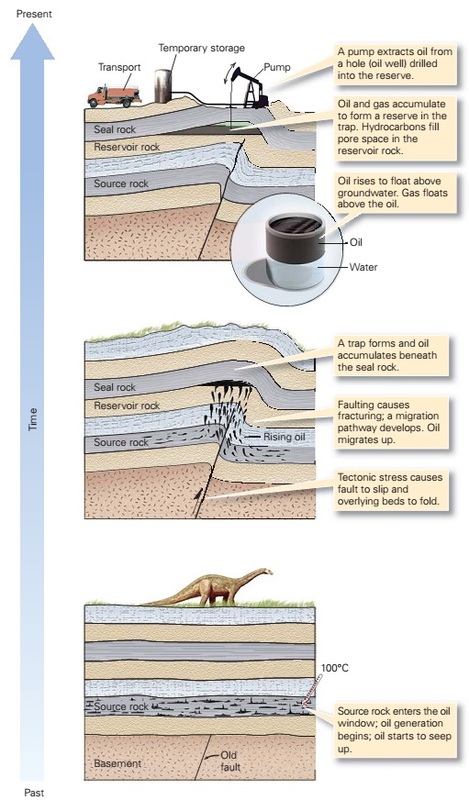 Geologic structures provide traps to further concentrate the accumulating petroleum. 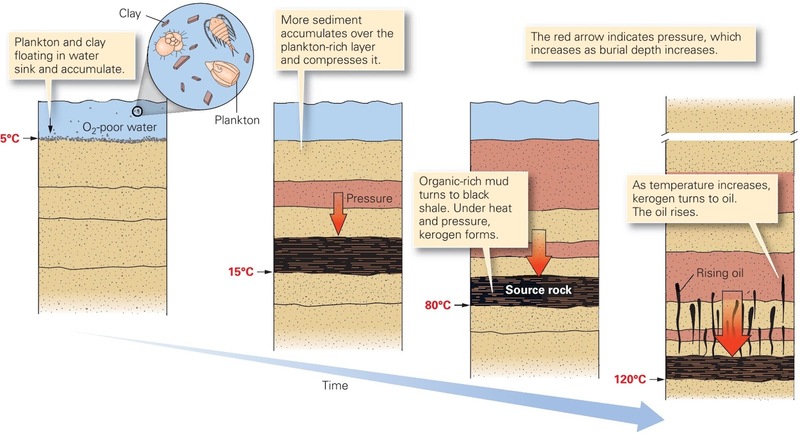 Accumulation of organic matter: It is well documented that oil accumulations are of organic origin and formed from organic matter in sediments. Methane can be formed inorganically and is found in the atmosphere of several other planets, but inorganic methane from the interior of the earth is likely to be well dispersed and thus not form major gas accumulations in the earth’s crust. 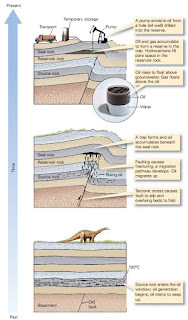 Formation of coal, oil and gas: The branch of geology that has the greatest economic importance worldwide is the study of fossil fuels (coal, oil and natural gas): they form by diagenetic processes that alter material made up of the remains of organisms. 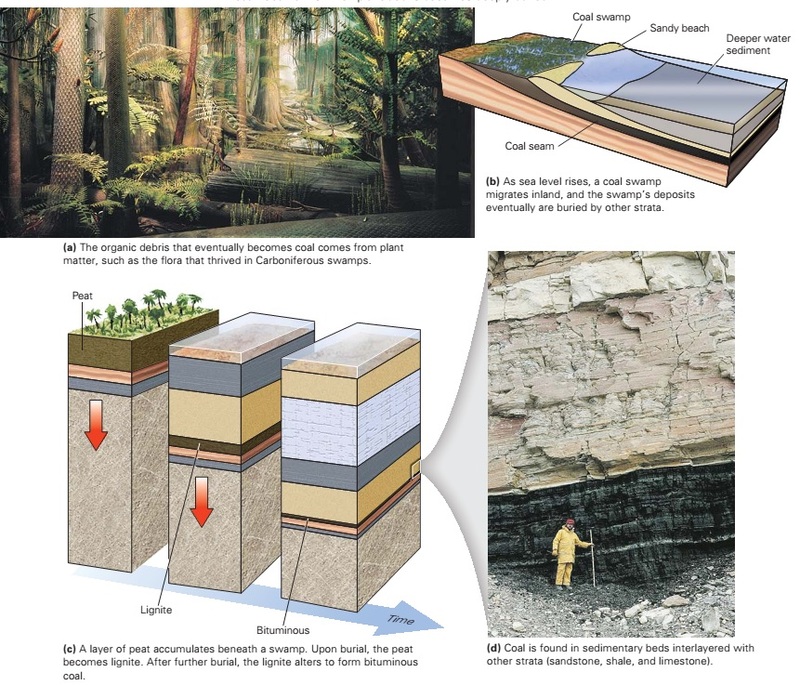 The places where the original organic material forms can be understood by studying depositional processes, but the formation of coal from plant material and the migration of volatile hydrocarbons as oil and gas require an understanding of the diagenetic history of the sedimentary rocks where they are found. 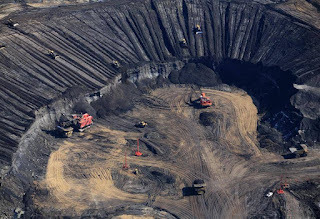 Heavy oil and Tar sands: Heavy oil seeping out on the surface has been known for a long time and this was easy to exploit for use in small quantities. Even after drilling for oil became successful (in 1857 in Pennsylvania), mining for heavy oil continued in many parts of the world including Germany. In southern California (Ventura and Los Angeles basins) oil was mined from the early 1860s to the 1890s because the heavy oil would not ﬂow to the wells. 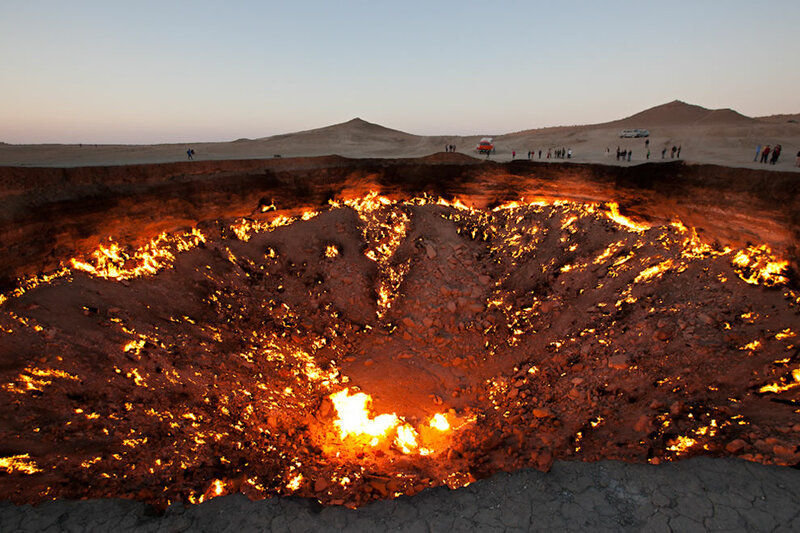 The door to hell: The door to heel is a field of natural gas in Darweza, Turkmenistan which was discovered in 1971. It is in the middle of the Karakum Desert, about 260 kilometres (160 mi) north ofAshgabat. The gas reserve found here is one of the largest in the world. The name "Door to Hell" was given to the field by the locals, referring to the fire, boiling mud, and orange flames in the large crater, which has a diameter of 70 metres (230 ft). The hot spots range over an area with a width of 60 metres (200 ft) and to a depth of about 20 metres (66 ft). Transformaton of Kerogen into Oil with burial and temperature increase: With increasing temperature the chemical bonds in these large molecules (kerogen) are broken and kerogen is transformed into smaller molecules which make up oil and gas. This requires that the temperature must be 80–150◦C over long geological time (typically 1–100 million years). 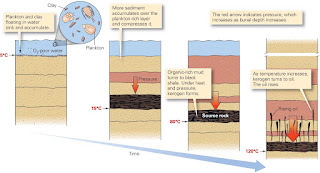 The conversion of kerogen to oil and gas is thus a process which requires both higher temperatures than one ﬁnds at the surface of the earth and a long period of geological time. Only when temperatures of about 80–90◦C are reached, i.e. at 2–3 km depth, does the conversion of organic plant and animal matter to hydrocarbons very slowly begin to take place. Types of Caprocks in Petroleum System: Caprock is a rock that prevents the ﬂow of a given ﬂuid at a certain temperature and pressure and geochemical conditions. For a long time, the only force causing the movement of oil and gas in the subsurface was believed to be buoyancy. If so, then to form oil and gas accumulation, their migration paths must have been stopped by a roof, i.e., caprock (seal). Clays, shales, carbonates, evaporites, and their combinations can form caprocks. The same rocks react differently to different ﬂuids.